Kimchi is the most famous traditional food and icon that well-represents Korea itself, as it accompanies almost every meal served in the country. The name of the dish also differs depending on the main ingredient used, where cabbage, radish or cucumber most often play the main role. In addition, there are many variations in recipes and forms, offering the fun of tasting different textures and flavors from all across the nation. In addition, kimchi is gaining more attention nowadays worldwide due to its enormous nutritional value, becoming an international wellbeing food not just limited to Korea. For as long as humans have been harvesting crops, they have enjoyed the nutritional elements of vegetables. In order to preserve the vegetables to enjoy during the cold winter months when cultivation was practically impossible, people soon developed a storage method known as pickling in which vegetables were fermented. 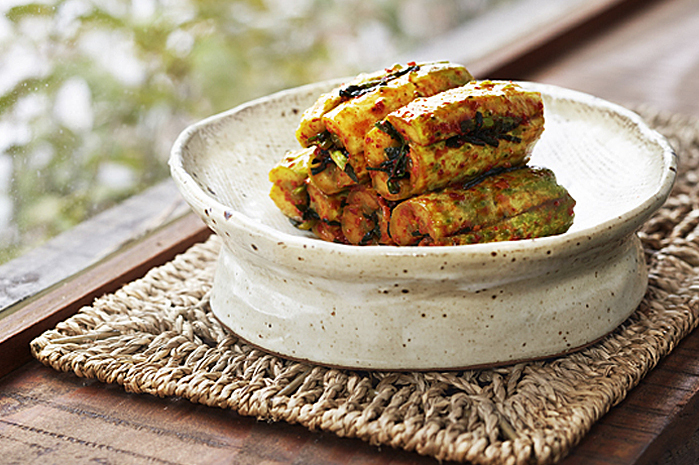 Rich in vitamins and minerals, kimchi was introduced in Korea around the 7th century. It is presumed that beginning from the 12th century, several spices and seasonings began to gain popularity The exact date when hot pepper powder was first added remains unknown, but was finally used as one of the major ingredients for making kimchi in the 18th century. In fact, the very same kimchi we know today has retained the same qualities and cooking preparations that prevailed ever since it was first introduced. 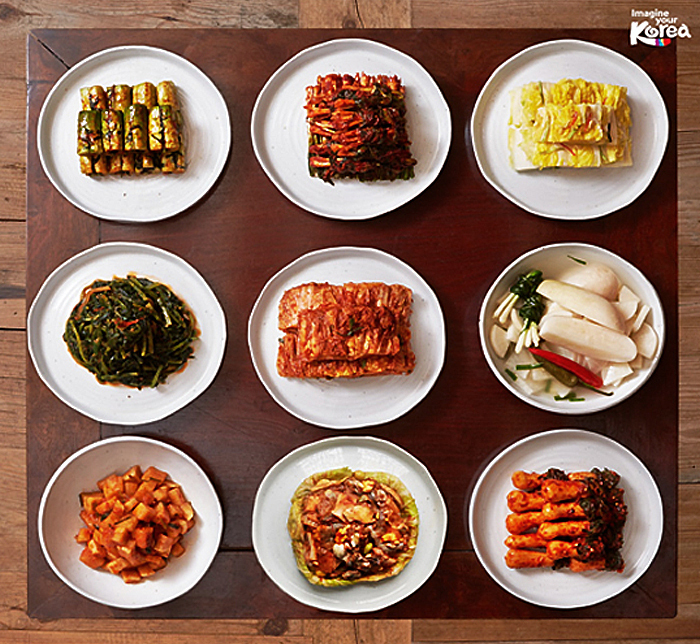 Eating kimchi is highly recommended because of its nutritional values! 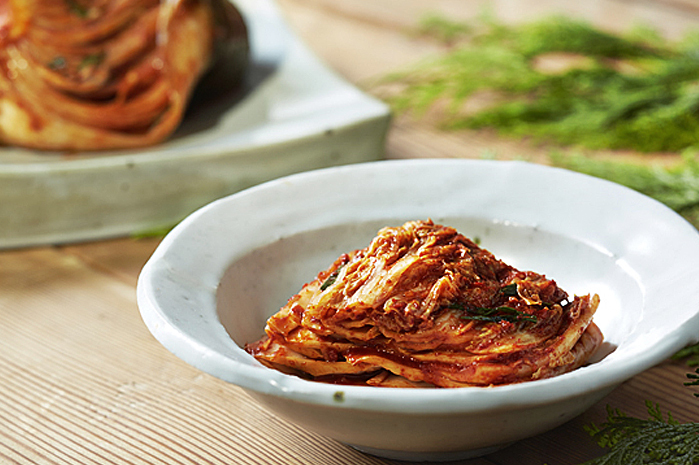 Thanks to the fermentation process, kimchi is packed with tons of vitamins and minerals. It also contains lactic acid bacteria, a bacterium that not only helps with digestion and combats harmful bacteria, but also helps prevent the growth of cancer. It was also featured in "Health," a famous health magazine, as one of the top five healthiest foods in the world. Since kimchi is so nutritious in many ways, and consumed throughout the entire year, it is often referred to as a staple food. This explains why you can find kimchi in all households throughout Korea. Regions, temperatures and other environmental conditions have led to the creation of more than 100 different types of kimchi. Read on to learn more about this fascinating dish. The most popular kimchi enjoyed by most Koreans, it is made with a whole salted cabbage (uncut) mixed with hot pepper powder, garlic, fish sauce and other spices, which is then left for fermenting. This particular kimchi varies by region, with the southern part of the country known for its saltier, spicier, and juicier flavors. 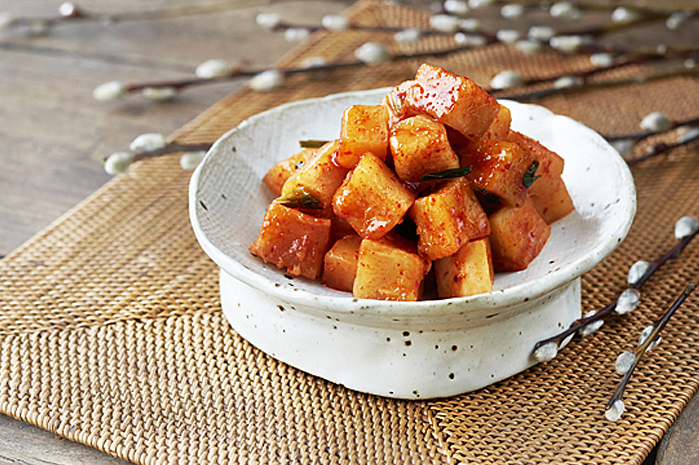 The basic ingredients used for fermenting are similar to that of baechu kimchi, with the exception that radish plays the main role in this particular case. Although radishes are available all year-round, winter radishes are sweeter and firmer, a top reason why many preserved side dishes are made of radishes. This is a less spicy version of kimchi with both cabbages and radishes combined. 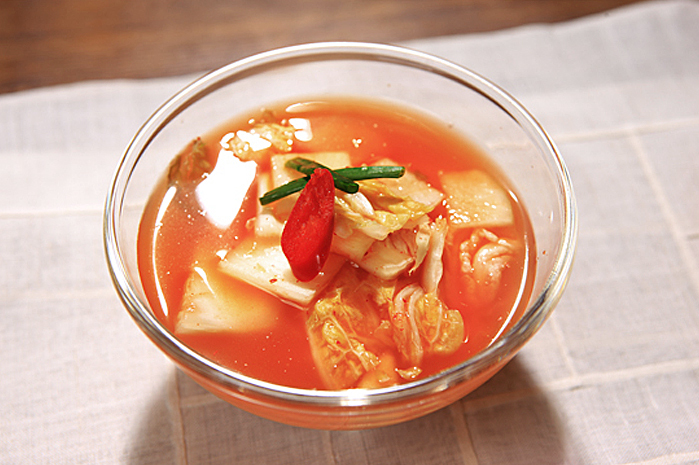 Using a great deal of kimchi stock, it tastes sweeter than other types of kimchi due to the addition of sliced fruits such as apple and pear. Although they are thin and small, young summer radishes are one of the most common vegetables for kimchi during the spring and summer season. Prepared with or without the fermentation process, yeolmu-kimchi completes almost all foods eaten on a hot summer day. This kimchi is preferred during spring and summer days, as the crunchy texture and juiciness of cucumbers create a refreshing variation to kimchi. The making of kimchi, or gimjang in Korean, is a significant household event taking place annually all across the nation with the taste of the dish varying by family and region. 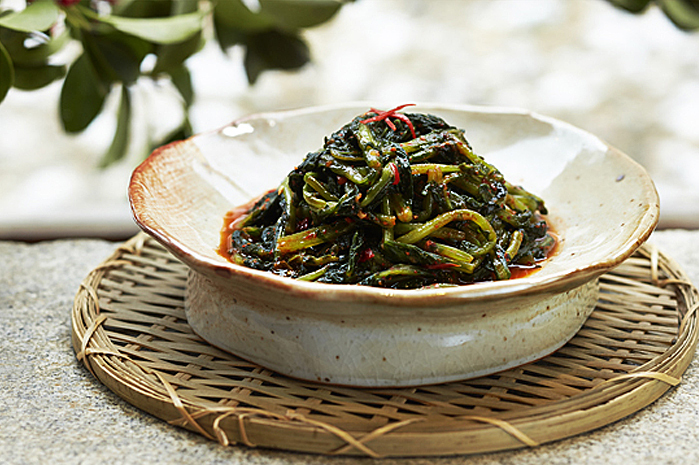 Recently, however, the number of households still practicing gimjang has been decreasing, with many preferring to consume store-bought kimchi instead. Reacting to this consumer behavior, more and more supermarkets, and even convenience stores are stocking large quantities of kimchi in their inventory. For the convenience of visitors and travelers coming to Korea, duty free shops located in major international airports and seaports also have airtight sealed kimchi products available. This page was last updated on August 12, 2016, and therefore information may differ from what is presented here.